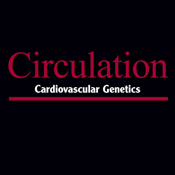 Circulation: Cardiovascular Genetics publishes articles related to research in human cardiovascular genetics, including studies on Mendelian disorders and complex cardiovascular traits and disorders. Research incorporates the latest clinically relevant analytical modalities (such as haplotype maps), genome-wide association studies, transcriptomics, proteomics, and metabolomics (biomarkers), and their application to diagnostics, prognostics, and therapeutics in genetic determined cardiovascular diseases. The scope of the journal extends well beyond cardiovascular genetics, with studies evaluating genomics, proteomics, metabolomics, and biomarkers as well. Reports of clinical trials using genetic and other biomarkers are regularly featured.